Thanks to a generous donation, the Chabad Jewish Center of Goodyear officially has a Torah scroll to call its own. The Chabad Jewish Center held a formal dedication ceremony April 3 at the Palm Valley Community Center in Goodyear to welcome the Torah to the West Valley. The scroll, which can cost as much as $30,000 to $40,000, is hand produced by a trained sofer, or scribe, and can take as many as two years to finish, Zaklikofsky said. The scroll has 304,808 individual hand-written letters total, accounting for the time it takes to complete the project. The scribe uses special parchment and inks, and carefully measures out the spacing used for each letter. The slightest error could mess up the entire scroll, Zaklikofsky said. The production and delivery of the scroll serves as a teaching tool for the scribe and the members of the synagogue, Zaklikofsky said. “The Torah is a gift from God to Moses and the Jewish people,” Zaklikofsky said. “The same way the Jews worked hard to reach that goal, to reach that milestone for the intense preparation they had to go through [to earn the scroll], we feel the same way 3,300 years later. Zaklikofsky said the West Valley Jewish population will feel more connected as a community as a result of receiving the scroll. It’s used several times each week during prayer. 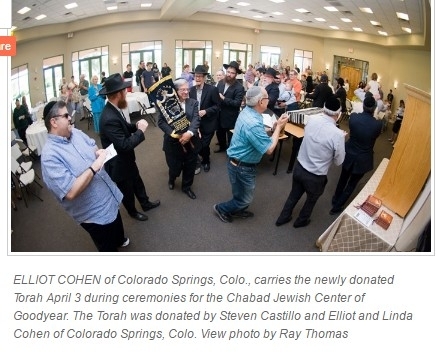 The Torah was made possible by Steven Castillo and Elliot and Linda Cohen of Colorado Springs, Colo.
Zaklikofsky spent time in Colorado Springs, as well as other small towns in the state, spreading his faith’s message while he was a rabbinical student. During 2005 and 2006, he took multiple trips to Colorado, especially during important dates, such as Chanukah and Passover. Zaklikofsky said the entire community is grateful for the generous donation. Shane McOwen can be reached at smcowen@westvalleyview.com or on Twitter @ShaneMcOwen.